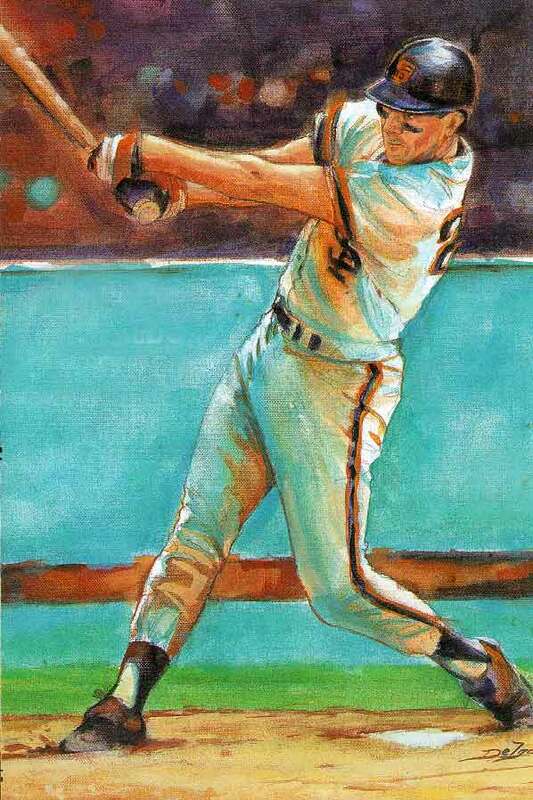 Throughout the years, Delgado had the pleasure of not only capturing San Francisco Giant's heroes on canvas but also meeting them in person. These are samples of favorites that he had been commissioned to capture over his career. 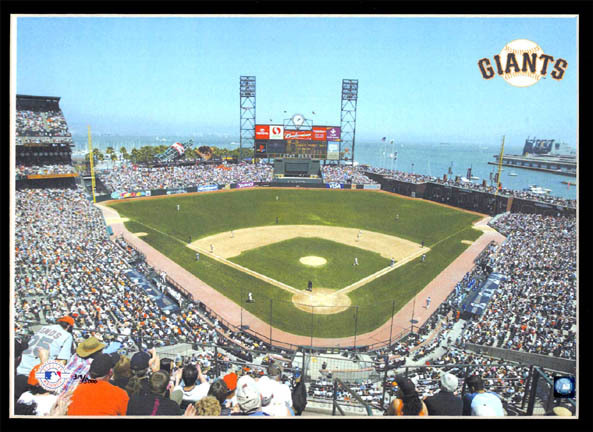 Edition photograph featuring opening day at the new ball park! Click here for detail information of this special offer. 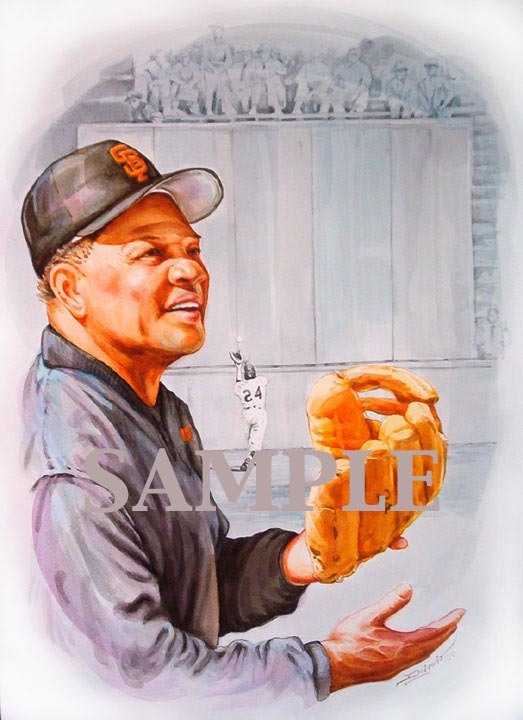 Willie Mays-Tribute to "1954 Catch"
"The Say Hey Kid" This work was originally commissioned by KNBR680 ,The Giants Radio station and the San Francisco Giants. This was created specificly as a tribute to his illustrious career and his famous 1954 Catch, one of baseball's greatest moments. Mr. Mays was inducted into the Baseball Hall of Fame in 1979 and is considered one of the sport's greatest players for all time. 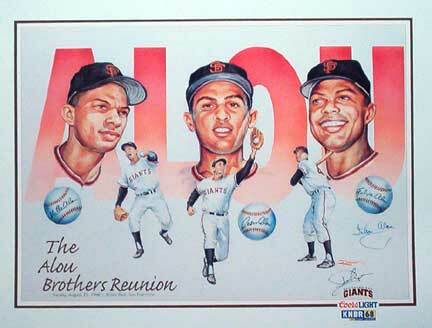 $28.00 Alou Brothers print, signed by artist. 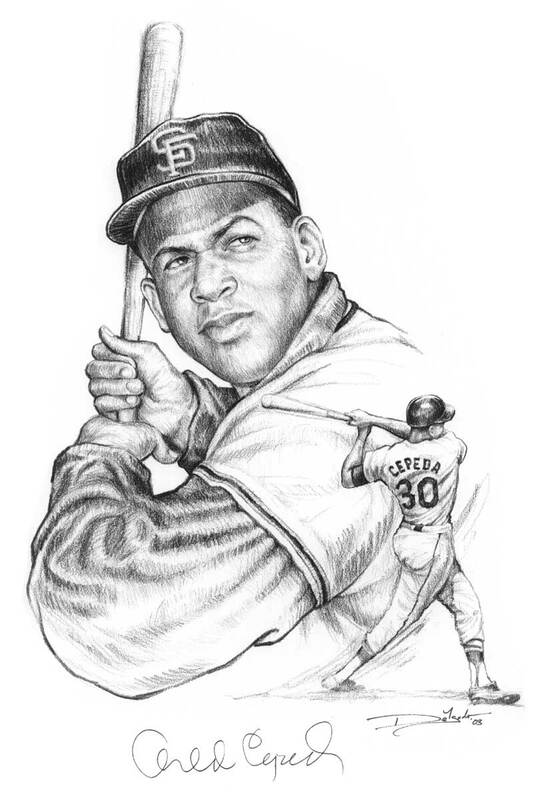 The commissioned work by Delgado features the famous Alou brothers who were honored at a Giants home game in a tribute to their legacy. All three brothers had appeared in a game together a first in Major League Baseball game which was a first. Each had a distinguish baseball record in their career in the sport. Currently Felipe Alou is the coach for the San Francisco Giants. $99.00 Lithograph-Autographed by Cepeda and artist. Shipping included. 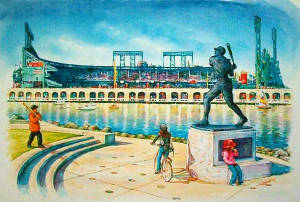 "The Baby Bull" This work was originally commissioned and presented to Orlando as a tribute to his illustrious career at Candlestick. 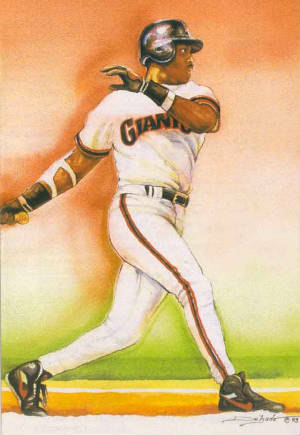 This Giant's Latino favorite was inducted into the Baseball Hall of Fame in 1999. Description: Printed on acid free museum stock. Autographed individually by Orlando Cepeda! Includes double matting, wood frame, glass and is ready to hang. Shipping included in the Continental US. For more info on this work click here. 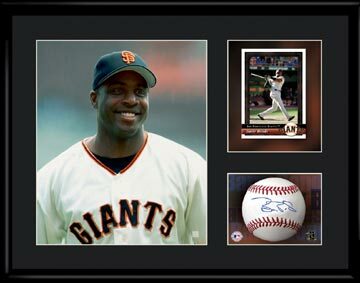 2003 MLB LICENSED LITHOGRAPHS OF BARRY BONDS EXCLUSIVELY OFFERED HERE!